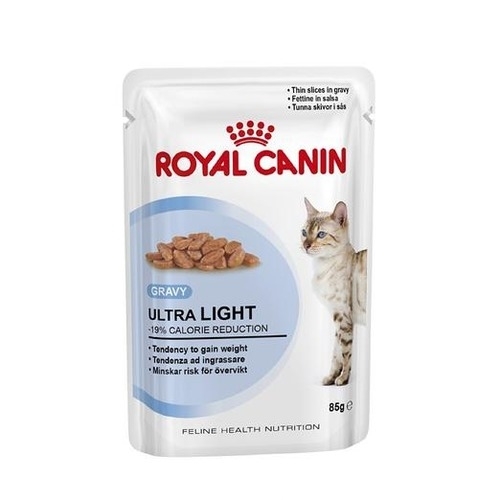 Royal Canin Feline Health Nutrition Ultra Light Pouch Cat Food comes in easy to chew small chunks smothered in gravy for better ingestion and digestion. 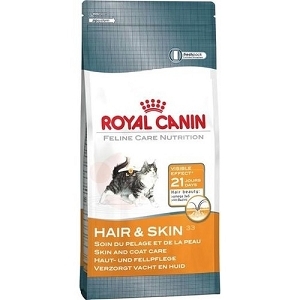 The ingredients in Royal Canin Feline Health Nutrition Ultra Light Pouch Cat Food contains 19% lesser calories which is suitable for helping your cat to maintain or lose weight. 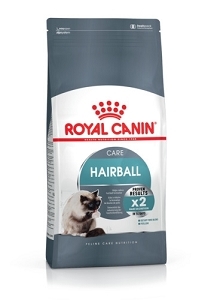 Formulated to help control the body weight of adult cats from 1 to 10 years? Ultra LIGHT contains only 61 kilocalories per 3 oz. can — 15% less calories than ADULT Instinctive™. Ultra LIGHT features L-carnitine to burn fat, plus a high protein content to help preserve muscle mass. 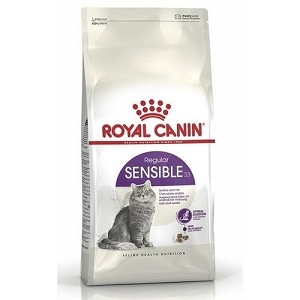 By utilizing Macro Nutrient Profile science, Royal Canin has formulated Ultra LIGHT to be instinctively preferred by adult cats. That means your cat gets a formula it loves while getting the precise nutrition it needs at each and every feeding. Every can of Royal Canin® Ultra LIGHT is backed by a 100% no risk guarantee. Water sufficient for processing, chicken, chicken liver, pork by-products, pork liver, gelatin by-product, dried egg product, powdered cellulose, wheat flour, natural flavors, corn starch modified, potassium citrate, calcium carbonate, guar gum, sodium tripolyphosphate, taurine, carrageenan, choline chloride, Vitamins [DL-alpha tocopherol acetate (source of vitamin E), thiamine mononitrate (vitamin B1), niacin supplement, biotin, D-calcium pantothenate, riboflavin supplement (vitamin B2), pyridoxine hydrochloride (vitamin B6), vitamin B12 supplement, folic acid, vitamin D3 supplement], L-carnitine, Trace Minerals [zinc proteinate, zinc oxide, iron sulfate, copper sulfate, manganous oxide, sodium selenite, calcium iodate]. ?